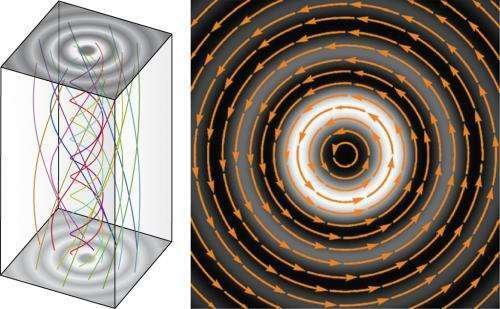 Reconstruction of photon trajectories (left) from the measured transverse momentum of light (right) in a vortex beam. Credit: Reproduced from Ref. 1 and licensed under CC by 3.0 at dx.doi.org/10.1088/1367-2630/15/7/073022. © 2013 K. Bliokh et al. Quantum mechanics provides such a different description of the world compared to classical physics that even Albert Einstein had problems comprehending the implications of the theory. However, sometimes the predictions attributed to quantum-mechanical effects alone actually conform to the framework and predictions of classical physics. Franco Nori, Konstantin Bliokh and colleagues from the RIKEN Center for Emergent Matter Science have now derived a classical theory explanation for a light beam experiment previously explained only through complex quantum-mechanical arguments. One of the fundamental principles in quantum mechanics is that certain properties of a quantum-mechanical object, such as a photon or electron, cannot be measured simultaneously with precision. The position of these particles, for example, cannot be determined at the same time as its momentum: measuring one property causes a certain 'fuzziness' in the determination of the other. A few years ago, an experiment in which both the path of photons and their interference patterns were measured simultaneously drew considerable attention. "This was because the experiment seemingly overcame the fundamental restrictions of quantum mechanics. Simultaneous measurements of the path information and interference picture are impossible in standard quantum theory, like the simultaneous determination of the coordinates and momentum of a particle." The results of the two-slit interference experiment—as it was known—were brought into line with quantum mechanics by arranging the measurements such that the results were averaged over several experiments conducted using a number of photons. This means that the precise position of a single photon was not actually measured. Instead, its properties were retrospectively deduced by making many measurements on identical particles. Explaining these experiments required complicated quantum theory arguments. Nori and his colleagues have now presented an alternative viewpoint. "We give a classical-optics interpretation of this experiment and other related problems," says Bliokh. Key to the researchers' classical interpretation is a description of the experiment based on the momentum density of light (Fig. 1). Because many photons are averaged, the results can be regarded in the context of the way light waves would be treated in classical theory. This approach, according to the researchers, can also explain how a number of other effects seen in the complex propagation of classical light similarly provide measurements of photon trajectories. Even though quantum physics can sometimes be very unintuitive, it is often surprising how many of these effects can also be explained by classical theory.